Jason Borger was the "Stunt Caster" in the movie A River Runs Through It for a reason! Not only is Jason an expert caster, he is a gifted teacher. His new book is a forward-thinking exploration of casting and mending. Self-teaching skills, like the 3-Step Exercise, and straightforward explanations make the text more easily explored by casters of all levels. With the Modular Approach, fly casting is packaged into focused, manageable chunks, allowing anglers to further take command of their own learning process. Enhancing the foundations are thorough breakdowns of what's really needed to make casts and mends work properly. 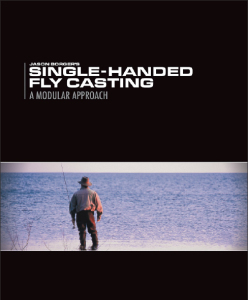 The text is also designed for those who teach fly casting, offering an organizational structure that can assist instructors in enhancing their own educational programs. Fully illustrated, B&W drawings by author. 8.5 x 11 inches, 320 pgs. Hardcover.